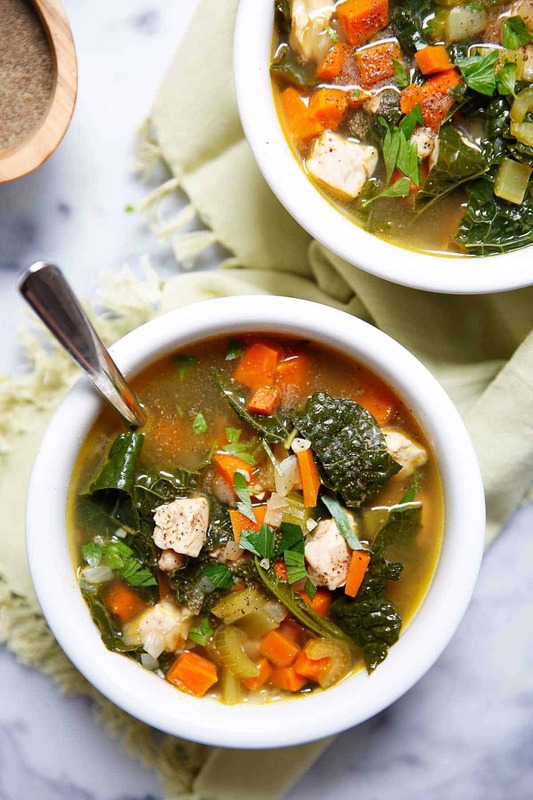 Swap the juice detox for a soup detox this season! 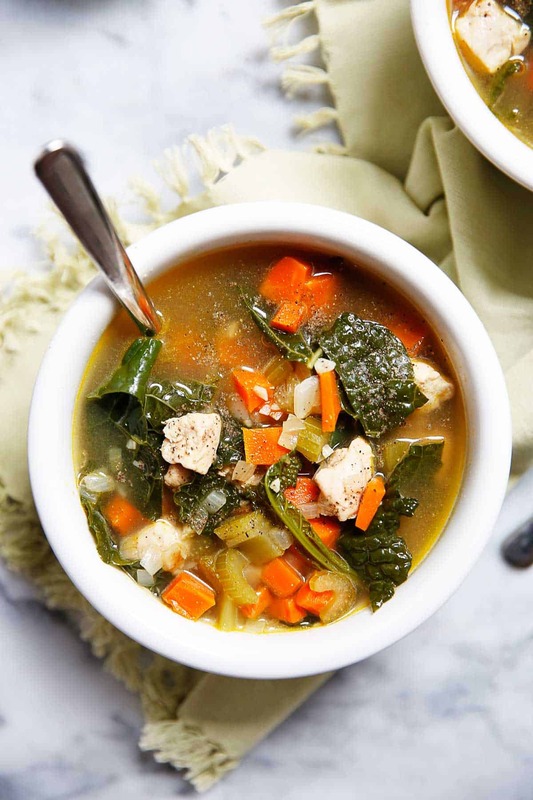 I call this Chicken and Kale Soup my detox soup because it is light, healthy, and packed with anti-inflammatory vegetables that are easy on the digestive system! The fiber from the veggies combined with the protein from the chicken makes this such a filling meal for any day of the week! Mike and I recently came back from a weekend in New York, where we were visiting my family and our friends! It was a truly great weekend! After a weekend of eating out, drinking, and changing up my daily exercise routine though, my body definitely needed a boost. Along with the list above, Mike and I decided that we needed a simple and light dinner tonight! This soup is now one of my go-to’s when I feel that I need to detox for a day! I love that every ingredient in this soup is from my local farm! It is also so simple to throw together! This soup is now one of my go-to’s when I feel that I need to detox for a day! I love that every ingredient is from my local farm and that it takes less than 30 minutes to make! Simply toss all of the ingredients in a pot, simmer for 15 minutes and BOOM. Soup complete with limited clean-up! 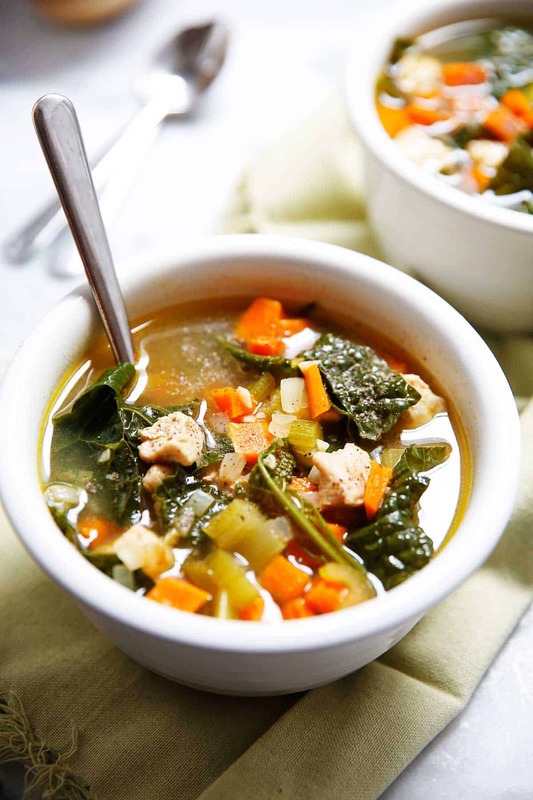 This soup is also perfect to warm up on with a cold and rainy day! Low-glycemic, paleo-friendly, egg-free, dairy-free, and Whole30 compliant! Feel free to spice this soup up a bit and add in extra spices! I love adding ginger, lemon juice, and red pepper flakes! Both lemon and ginger are known to aid in digestion and add such great flavor to the soup! In a large pot over medium-low heat, heat oil. Add in onion and garlic and sautè for one minute. Add in carrots and celery. Sautè for five minutes, until onion is translucent. Once onion is translucent, add in chicken and sautè until chicken is opaque and fully cooked through. Should take about 8-10 minutes. Stir occasionally. Pour in chicken stock and season with salt, pepper, ginger and lemon juice if using. Quick, easy, and delicious recipe! Good recipe for a light dinner so you dont feel too queasy at night from a heavy meal ~_~ haha good job! 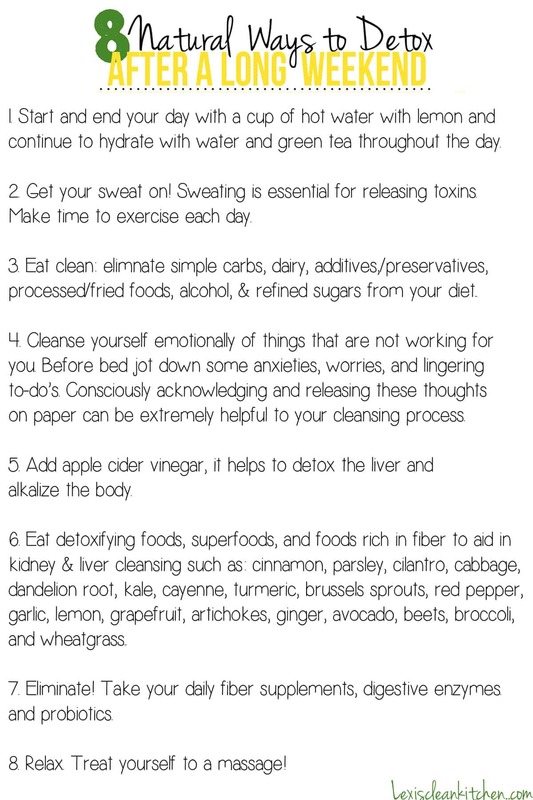 Just found your blog from Davida’s, and I love these tips! The soup looks delicious, too – I often throw onion, carrots, celery, some protein, and some veggies in a big pot and see what happens … soups are so easy, healthy, and satisfying! Another hit! Made this last week to rave reviews at home. My husband made many quarts of chicken stock this weekend so that I can keep making this soup! So happy Danni to hear that!! Just made this soup and half the pot is gone!! I love your site and how easy you make cooking!! This is an awesome soup, you ROCK!! Do you think this recipe would work well in a crockpot? Can’t wait to make this soup! What are your thoughts on making this with beef? Hmmm never thought to try beef. I’m sure it would be great! Sorry if this is a silly question… but do you add the chicken raw to the veggies and let cook for 8-10 mins? I searched for a DETOX, after buying ingredients. I stumbled across this recipe. It is delicious! This will be my weekend meals, if my family doesn’t devour it. You forgot to add the kale in the directions. I loveeeeee this recipe!! Even my 6 year old loved it! I added diced tomatoes and cilantro! I’ve made this recipe at least 4 times already. I just made this soup and it is delicious! I love the kick of the lemon and ginger, it gives it something special. I used meyer lemon for a more sweet flavor and a colored carrots bunch. I added a small beauregard yam and a potato. Very good. They’re coming! In the meantime, feel free to use any free online nutrition calculator!!!! Is bone broth and stock interchangeable?